The MAG (Murray Art Guild) Community Art Center is a community based non-profit organization dedicated to supporting arts enrichment. The MAG was established in 1967 when several like minded community members established a place where artist's could create art as well as exhibit and sell their work. Fifty years and several locations later, this goal is still key to our mission as we provide arts programming for local youth and adults in a range of mediums, host year round exhibitions and house community studios and an Art Market. The MAG welcomes participants of all ages and abilities. We are proud to promote the delectation that comes from art. Motivating artistic growth through community arts development. Our facility houses two community studios, a weaving studio, and a clay studio. 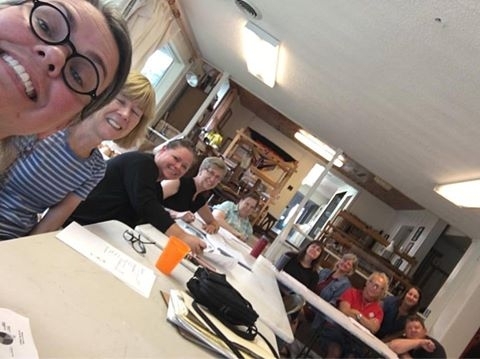 Members have access to the community studios during MAG hours and can sign up for loom time (floor looms and table looms) and clay studio use. Also available for members use is a matting and framing area, photo documentation area. Currently the MAG is renting five studios to individuals for their sole use. The MAG is thriving due to our wonderful volunteers! From cleaning floors and stuffing envelopes to painting trim and setting up events, give us a call to see what you can do! The MAG partners with Murray State University to place one intern every year. Interns will work in a variety of positions such as: running the Art Market, helping the MAG with marketing/promoting, helping with community art projects, or teaching art workshops! We try to match the student's strengths and interests to our goals to help students get the most they can out of their experience. Drop by your resume in the spring for the upcoming school year or CLICK HERE to download more information and an application! You can help the MAG while you do your normal shopping. We raised over $1000 for programming through these programs last year. Sign up today & let your shopping do the work for you! 1. Amazon Smile Program. After signing up, Amazon will donate .5% of all purchases you make through the "Smile Amazon" page to the guild. Easy! Board meetings are held on the 2nd Tuesday every month from 6-7pm. The public is welcome!